A 2.00 m × 1.70 m oil painting showing historical U.S. flags. This article describes the evolution of the flag of the United States of America, as well as other flags used within the country, such as the flags of governmental agencies. There are also separate flags for embassies and boats. Since 1818, a star for each new state has been added to the flag on the Fourth of July immediately following each state's admission. In years which multiple states were admitted, the number of stars on the flag jumped correspondingly; the most pronounced example of this is 1890, when five states were admitted within the span of a single year ( North Dakota, South Dakota, Montana, and Washington in November 1889 and Idaho on July 3, 1890). This change has typically been the only change made with each revision of the flag since 1777, with the exception of changes in 1795 and 1818, which increased the number of stripes to 15 and then returned it to 13, respectively. As the exact pattern of stars was not specified prior to 1912, and the exact colors not specified prior to 1934, many of the historical U.S. national flags shown below are typical rather than official designs. With the addition of states, the U.S. flag increases the number of stars. Examples of possible designs for U.S. flags with up to 5 additional states are displayed here. Many agencies, departments, and offices of the U.S. federal government have their own flags, guidons, or standards. Following traditional American vexillology, these usually consist of the agency's departmental seal on a blank opaque background, but not always. Flag of an Unrestricted Line (URL) Navy admiral. Staff Corps Flag Officers have white flags with the appropriate number of blue stars in an identical pattern as URL admiral's flags. The flags of the U.S. states, territories and federal district exhibit a variety of regional influences and local histories, as well as different styles and design principles. Nonetheless, the majority of the states' flags share the same design pattern consisting of the state seal superimposed on a monochrome background, commonly every different shade of blue. Dates in parentheses denote when the current flag was adopted by the state's legislature. While the countries mentioned are recognized independent nations with UN seats, the U.S. maintains and exercises jurisdictional control over the countries in defense, security, and funding grants. Since 1777, the national ensign of the United States has also simultaneously served as its national flag. The current version is shown below; for previous versions, please see the section Historical progression of designs above. ^ The Mississippi flag was first adopted in April 1894. However, it was repealed in 1906, remaining in de facto usage until its official re-adoption in April 2001. ^ Artimovich, Nick. "Questions & Answers". North American Vexillological Association. p. 8. Archived from the original on April 17, 2007. Retrieved 2007-03-20. ^ Kaye, Ted (2001-06-10). "NEW MEXICO TOPS STATE/PROVINCIAL FLAGS SURVEY, GEORGIA LOSES BY WIDE MARGIN". North American Vexillological Association. Archived from the original on October 19, 2013. Retrieved 2007-10-07. ^ "State Flag of Alabama". Alabama Emblems, Symbols and Honors. Alabama Department of Archives & History. 2006-04-27. Retrieved 2007-03-18. ^ Anderson, Ed (November 22, 2010). "New Louisiana state flag with bleeding pelican is unfurled". The Times-Picayune. Archived from the original on November 24, 2010. Retrieved November 24, 2010. ^ "Official State Symbols of North Carolina". North Carolina State Library. State of North Carolina. Retrieved 2008-01-26. ^ "The Oklahoma State Flag". NetState. NState, LLC. February 6, 2014. Retrieved January 26, 2015. Colors shall be colorfast and shall not bleed one into another. Added by Laws 1925, c. 234, p. 340, § 1. Amended by Laws 1941, p. 90, § 1; Laws 2006, c. 181, § 1, eff. Nov. 1, 2006. ^ "Enrolled Senate Bill No. 1359". Oklahoma State Courts Network. May 23, 2006. Retrieved January 26, 2015. This act shall become effective November 1, 2006. ^ Dan Bammes (2011-02-17). "Legislature: Fixing the Flag". KUER-FM. Retrieved 2011-02-17. ^ "Utah State Flag Concurrent Resolution, 2011 General Session, State of Utah". Retrieved February 17, 2011. ^ Keith McCord (12 February 2011). "Resolution aims to correct state flag goof". KSL-TV. Retrieved 16 February 2011. ^ Dennis Romboy (9 March 2011). "Utahns celebrate first State Flag Day". KSL-TV. Retrieved 10 March 2011. ^ State of Wisconsin. "286". Section: 1.08: State flag. Laws of 1979. Retrieved August 21, 2015. The department of administration shall ensure that all official state flags that are manufactured on or after May 1, 1981, conform to the requirements of this section. 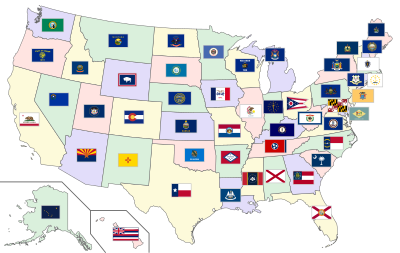 State flags manufactured before May 1, 1981, may continue to be used as state flags.